So What Exactly Is Drone Racing? Home/Drone Sports, Drones, FPV/So What Exactly Is Drone Racing? As a sponsor of Drone Nationals, a question that I’ve had to answer more than once is “What is drone racing?” I’m sure with the growing popularity of the sport, I’ll be answering that question a bit more frequently. 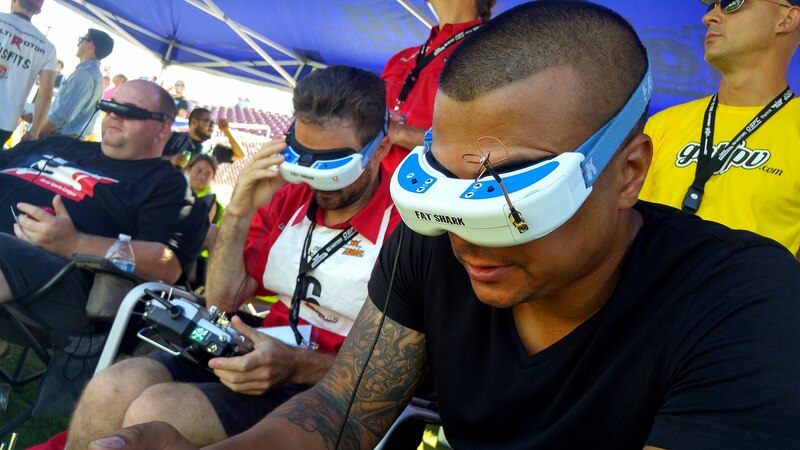 Drone racing is a new sport, enabled by drones and FPV or first-person view displays. It’s fast moving and takes advantage of the agility inherent in small quadcopters. If you are into drones and like high speed racing, then drone racing maybe the perfect combination for you. Drone racing is a sport where drone pilots strive to build extremely fast and agile multi-rotors (otherwise known as drones) to fly around a set course as fast as possible. Almost all drone races today are done using FPV (First Person View) systems. FPV is a type of drone flying where pilots use cameras to fly drones as if they were sitting in the cockpit. Some pilots fly using FPV monitors, where as others use specialized FPV goggles to give them a more immersive experience. FPV flying was originally done using RC Planes, but in recent years, multi-rotor drones have become extremely popular, much more stable, easier to fly, and more agile than RC planes. All of this has made multi-rotor drones the perfect platform for FPV flying. From late 2013 to 2015, people began making FPV drones that were much smaller than what was considered the standard. This allowed them to be even more maneuverable than before while also being able to fit through tighter spaces and hold up better in crashes. After flying these mini FPV drones, it became apparent that FPV Drone racing was going to become extremely popular in the future. In response to the growing popularity of drone racing, we have recently added a Drone FPV (First-person View) piloting course at our drone college. If you’d to learn more about this and other drone college courses available at Drone Universities, then check out our course information page. Classes are available at rotating locations throughout the US and at our Section 333 exempt drone training facility in California’s Central Valley. By Sam Estrin|2017-08-31T15:24:17+00:00October 2nd, 2015|Drone Sports, Drones, FPV|Comments Off on So What Exactly Is Drone Racing?